In Guitars > Show & Tell. 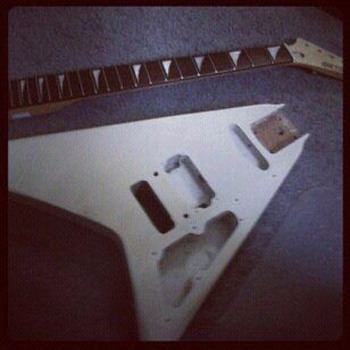 Just picked this up its in pieces, starforce/ randy rhodes/ copy, will keep you posted, plan to build it / see what happens. been do'n reasearch, found out better try out the orig. pikups, the tremalo will be up graded,,,probly one of those old strat set ups, new tuner machines of course, new pots,,,,,,,,,,,,,,,? leave'n the finish alone looks perfectly worn like one of them there relics ! little inlay repair/pearl on the neck just a small chip , cant wait to hear this thing,n feel its balance. all org. parts are present, somone took it apart, n just gave up, well thats where I come in !